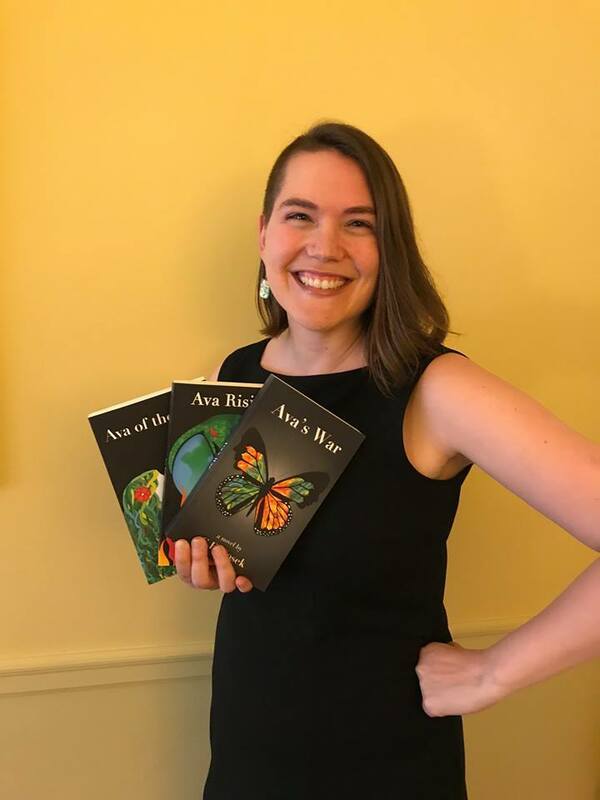 Grace Nosek presenting her Ava of the Gaia trilogy! Grace applied to Climate Guides with the longtime dream of launching a hopeful climate podcast. With the support of seed funding and mentorship, she turned her hopes into reality and released Planet Potluck. Now, well into her fifth episode of the podcast, Grace explores the intersections of climate justice and public engagement. Every episode shares stories of joy, hope, and community in the climate fight. “Hope is contagious, and by working together in our local communities, we can all play a role in inspiring more action to help turn the tide in the climate fight,” says Grace Nosek, in a CBC Opinion Piece. 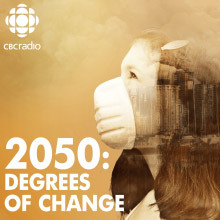 One of Grace’s mentors was Johanna Wagstaffe, CBC meteorologist and creator of the 2050 Degrees of Change podcast. Last summer, Grace shared her work on this CBC podcast (Episode 7: A New Future), alongside David Suzuki and climate scientist Simon Donner. No big deal! 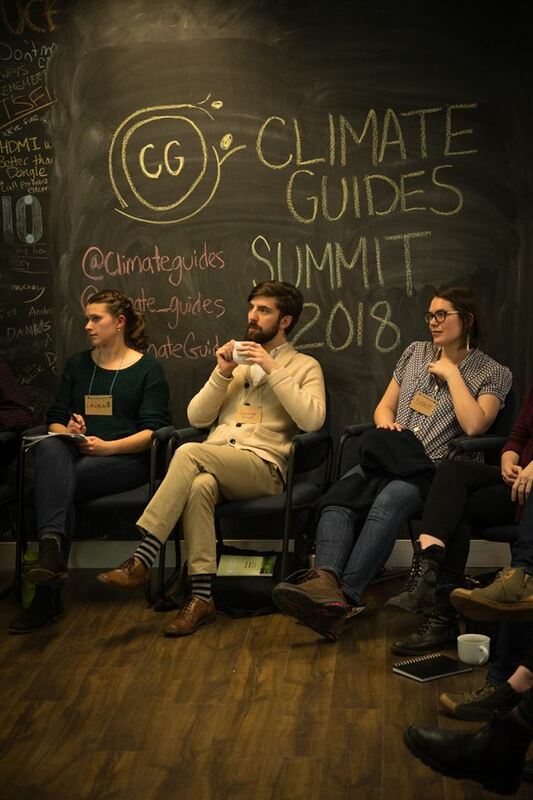 Grace Nosek continues to explore ways to engage people in community taking climate action. As a Trudeau Scholar PhD candidate at UBC, she studies how a well-funded fossil fuel industry has spent decades undermining climate science and making the public feel powerless to take action. If this sounds doom-and-gloom, Grace flips the narrative on campus with the UBC Climate Hub. She started a mentorship program for over 120 students this past Fall. Her program connects undergraduate students with graduate students and professors on specific themes. In turn, this has inspired Climate Guides’ new second cohort with themed groups! Her work impacts community beyond measure. 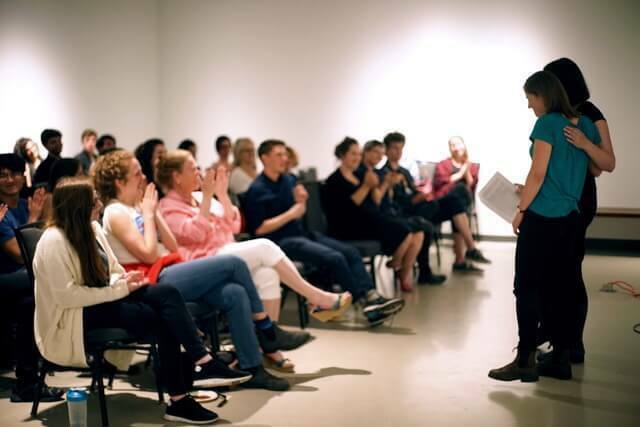 One of Grace Nosek’s Storytelling evenings at the UBC. A climate community gathering that ended in dance! Grace Nosek joined the 2018 mentorship cohort. One of these impacts is through dancing! Grace often says, “I’ve never met a dance party I didn’t want to join.” At the end of her Climate Hub meetings, she is known to turn them into upbeat dance parties. Naturally, this week, she will present her Planet Potluck podcast during a talk, social and dance party. This event will be hosted by Nada, Vancouver’s first zero waste grocery store that was co-founded by one of Climate Guide’s very own mentor, Alison Carr. Together, community will learn of her studies, podcast, and spread hope through dance. While dancing brings out the extrovert in us all, Grace also connects with introverted audiences through her Ava of the Gaia Series. Her trilogy is a young adult eco-fantasy that tackles climate change through storytelling. This strong female lead is likeable, spirited and wise beyond her years, just like Grace herself! This series is available on e-book and will be available for purchase at the Climate Narrative: A Talk, Social & Climate Dance Party on Thursday, April 11th. See you on the dancefloor!